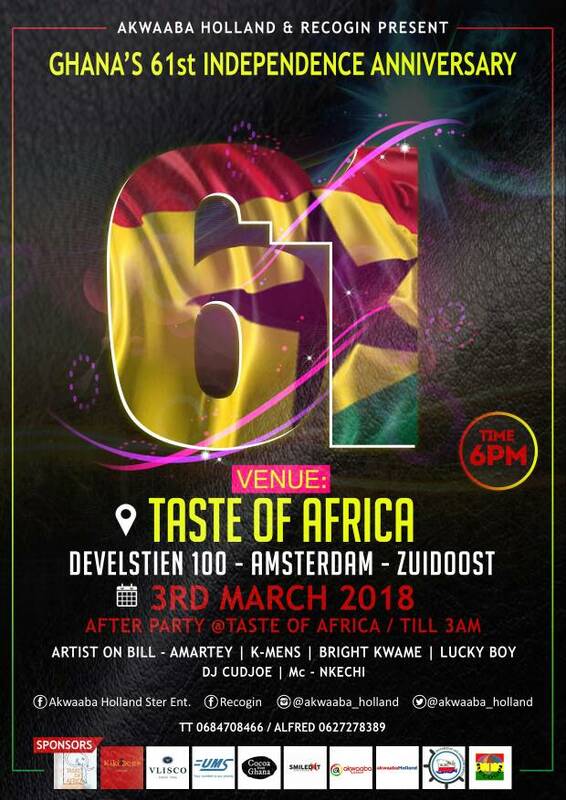 Akwaaba Holland and Representative Council of Ghanaian Organizations in The Netherlands (RECOGIN) will hold Ghana’s 61st Independence Party on Saturday 3 March, 2018 at Taste of Africa. The event will start at 6pm and ends at 10pm. The afterparty is at the same venue till 03.00am. There will be music and poetry performances. Artistes on the bill are: Amartey, K-MENS, Bright Kwame and Lucky Boy. The DJ for the event is DJ Cudjoe and the mc is Nkechi. A ticket costs 5.00 EUR. You can purchase it at Unity Monetary Services in Ganzenhoef or at the Recogin Office. Venue: Taste of Africa at World of Food, Develstein 100, 1102 AK, Amsterdam.